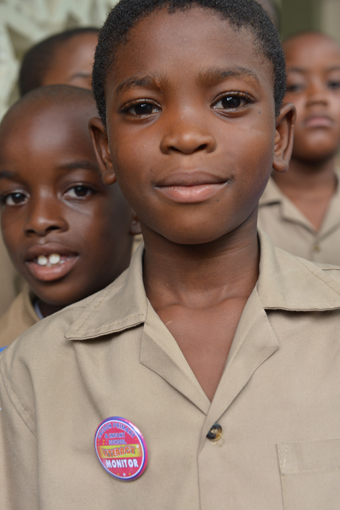 On my recent trip to Jamaica I visited Cacoon School to say ‘Hello’ and to see how the new library was developing. This was the first visit since my donation of 1,000 books in May of this year. The library is in place. Mrs Carole Grant, the principal, showed me the room in the school where the library has been set up. It is a nice, quiet room with books displayed on shelves, and chairs and tables nicely laid out for the children. I was very impressed. A scheme for Reading Monitors has been introduced. Teachers have selected, from each class, two or three children to act as Reading Monitors. The Monitors wear a ‘Reading Monitor’ badge on their uniform that Mrs Grant had made especially for the school. The Reading Monitors are responsible for encouraging fellow pupils to read and improve their literacy, supporting their interest in reading by taking them to the library and helping them to select appropriate books. This is a kind of peer group support, where pupils are helping other pupils, rather than just the teacher helping. The Reading Monitors are already active in the school. I thought this was a brilliant idea and the pupils seem to be quite keen on these pretty little badges. I visited with Derek two days after Jamaica’s Heroes’ Day, and during the school’s Heritage Week when the focus of study was on Jamaica’s seven national heroes. The classes we visited were Grades 5 and 6 and I asked them if they had been reading any of the books from the library. Many children were quick to name the books they had read, and because it was Heritage Week they had all been reading from the history books I had donated, including Sam Sharpe, The Arawaks, and Nanny of the Maroons. The classes also read some passages from the books for us. At the end of our visit, the class teacher suggested that one of the pupils should stand up and say a ‘thank you’ to us. The first pupil who came forward was a little shy, and too embarrassed to speak, so another pupil came forward and gave a well rounded ‘thank you’ to myself and Derek. 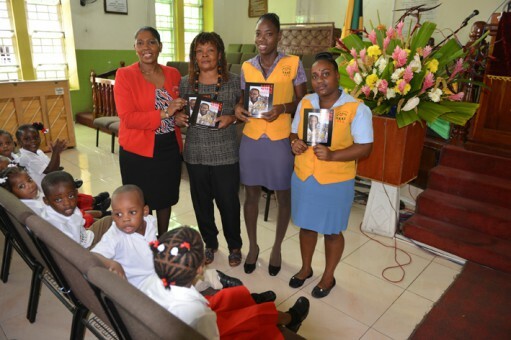 In addition to visiting Cacoon, I donated 200 copies of the Handprint publication, Sam Sharpe and the Christmas Rebellion to the Burchell Memorial Baptist Church in Montego Bay. I went to the church during Heroes Week, on Thursday, 16 October 2014. This was a timely donation because not only is Sam Sharpe a National Hero, he is buried under the pulpit of the Burchell Memorial Baptist Church. I felt very honoured to be able to make such a donation to the church. Pastor Davewin Thomas, and staff members Mrs Millicent Jackson and Mrs Joy Virgo received the presentation for the church. 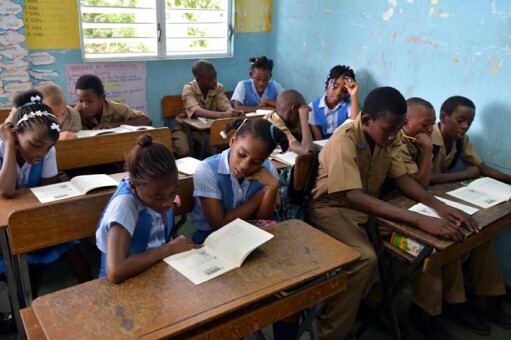 The church is part of a circuit of Baptist churches in this part of Jamaica and the books will be used with church school groups across the parishes of Trelawny, St James and Hanover. 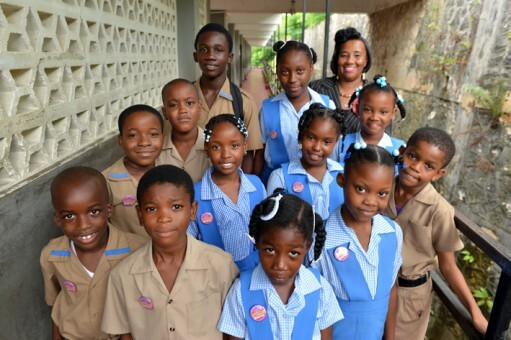 While we were going around the Church, we met Dionne Lewis, Principal of Aplus Academy of Excellence in the Mount Salem district of Montego Bay. She was there with a group of her children and teachers to learn about Sam Sharpe. 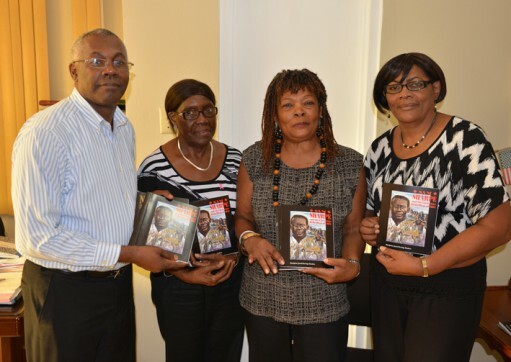 I gave copies of the Sam Sharpe publications for their school. In addition, on a trip to Kingston, with Derek, the Italian film maker Giulia Amati, and Ivan Coore (whose brother Cat Coore is a member of Third World Band), we went to visit a coffee farm in the Blue Mountains. On the way, Ivan introduced me to a lovely lady, Mrs Violet Nelson JP (known by everyone as Miss Pansy) in Mount James District. Miss Pansy is the Chairperson of the local St James Day Care & Learning Centre. The Centre has 15 pupils, aged two to six years old, one teacher, one care giver and a cook. We were shown around this lovely and welcoming little school, and given the chance to observe the class, all neatly dressed in their smart uniforms, working away. Miss Pansy told me that she went to this little school, and that her mother before her also went there. Like Cacoon, and so many other schools in Jamaica, the St. James Day-Care Learning Centre is very short of basic resources, and Miss Pansy asked for my help. The school’s computer stopped working recently, so Miss Pansy is trying to find funds to buy some tablet computers. The Jamaican government wants every child to have access to tablets and are making lots of lessons available for these new devices. The problem, as ever, is that they are very expensive in Jamaica and so not all schools will be able to buy them. And, of course, many parents will not be able to give their children access to this new technology. There’s also a shortage of books in the school. I felt that the least I could do was to send Miss Pansy five sets of the Heritage Readers for her school.